An inking warm-up, otherwise known as a procrastinating-before-doing-paying-work, for your perusal. Imagery borrowed from various Symbolist paintings. Click to enlarge. Very specific instructions for this one. Reproduce an existing watercolor's scene, with the camera 180 degrees from where it was in the first one. Interesting challenge. Click to enlarge. Commission rates here. Art Spiegelman talks about creating this bygone fad, though unfortunately I don't see painter John Pound mentioned. Funniest fact: Maus was due out at about the same time. His editor begged him not to admit to the GPK connection, lest Maus be dubbed "Garbage Pail Jews." America’s most famous and successful painter passed away Friday, reportedly peacefully in his sleep, unexpectedly. He was the same age as me, 54, and we had been roommates for a year while we both attended Art Center College of Design in the late seventies. I can’t honestly give a warm tribute to a dear chum, because Thom and I never clicked. While he had tremendous strengths, and a certain crazy charm, he was vexing in a lot of ways, too. He later described this time as being his darkest, just before his rebirth in Christ, though he didn’t seem gloomy. On the contrary, he was a boisterous, cocky bohemian (beret and all), who made sure you understood how brilliant he was before the end of your first conversation! Here's a classic Thom anecdote. Soon after moving in, he bought the then-fashionable illustrator’s tool, an airbrush. He was going to blow away everyone who’d ever used one (he later coined the term “blowawaymanship,”). Drew Struzan, Charlie White, Peter Lloyd, look out! Thom did a caricature of comedian Jonathan Winters, and started airbrushing over it. But the tool was hard to handle. It spattered. He overworked the painting. It was chalky and crude. He gave up in disgust. As I recall, he put aside the airbrush until he was doing backgrounds, a few years later, for the Bakshi/Frazetta film Fire and Ice, where it served well for mists and moonglow. But that confidence, a deep trait, served him well. Thom was daring in everything he did. He cut a swath through the coeds of Art Center, just as he had at Berkeley. Then, when he was making cash delivering pizzas weekends on his motorcycle, he demonstrated why pizza delivery men are a clichè in adult films. To a timid virgin like me, his tales of conquest (and comedic mishap, sometimes) were mythic. But Thom never seemed much taken with girls who fell for him. It was the cliché of not caring to be in any club that would accept you as a member. He did, however, put his old flame Nanette on a pedestal as high as Everest. She was then unavailable, involved with a fellow nursing student upstate. When that started to sour (when they fell off a horse they were riding, the guy falling on Nanette, breaking her leg, as I recall) – new hope filled the apartment. Thom took trips up to woo her, and eventually won his golden girl. Nanette was a sweet young woman, and I hoped she knew what she was in for. Thom was a sun about which planets orbited. But they seem to have had many happy years together, up until the last few (they separated a couple of years ago), and raised four pretty daughters. During that courtship, Thom did a memory painting of Nanette and himself on a moonlit walk. He had the insight, I remember, to make the shadows not very dark. 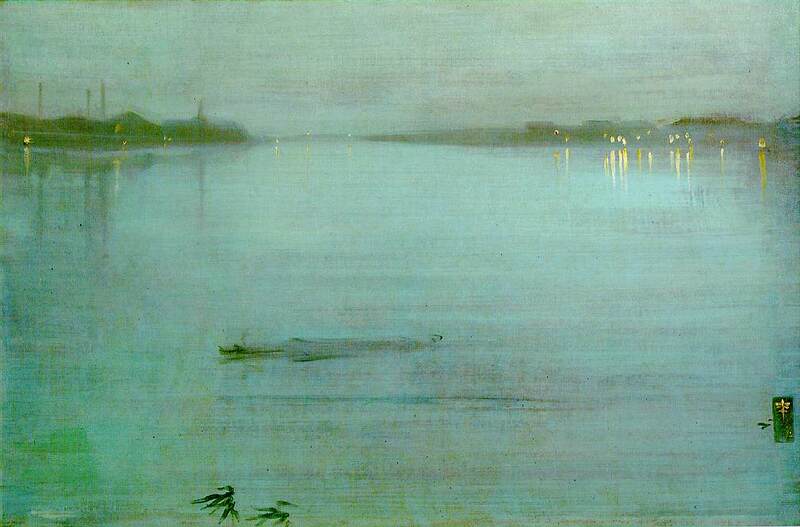 Like Whistler’s nocturnes, the piece had very little contrast, and it really felt like moonlight. It was striking. So was a lot of his landscape work (he never mastered the figure very well, I felt). His frontier scenes, in the manner of John Stobart, and his Bierstadt-influenced Yosemite paintings, were great. Anybody repelled by his shining, cute cottages should reserve final judgment until they’ve seen these. True, he mostly did paintings I think of as desserts with too many flavors of sherbet in them, because they sold. But the guy could paint. If you want to see the Kinkade I knew, rent Thomas Kinkade’s Christmas Cottage including the DVD extras. Pay attention less to the too-sanitized movie (great cast, but a limp story) than a short feature starring “Ed Aknik.” It's Thom, goofing around as a character of his own creation, clearly having a ball, unafraid of looking silly. The egotism, the occasionally-glimpsed mean streak, the shameless phony hype, the sharky business practices, the proclamations of piety, the platitude-filled books of inspiration, all irked me. So much seemed a cynical pose, contrived branding. And the ill-used moms and pops who were ruined by their Thomas Kinkade Signature Gallery experiences should’ve haunted his conscience. I will say the guy was brave, dynamic, really knew how to have fun, and was interesting to be around. He did things. He had more fire in his belly than a volcano. He conceived a dream of being famous and rich, and worked hard as hell to achieve it. You have to give him that. The photos of Thom, me and Jim Gurney were reference shots in 1980. Click to enlarge.